There have been a lot of changes lately in this telescope tourist’s life. Two big changes dwarf the others, and gave rise to lots of little fractal-like changes of their own: I started my first real, non-internship job covering space and physics for Wired.com, and I moved from the east coast to Seattle. To get to Seattle, two of my dearest friends and I packed everything we could fit into my tan Toyota Camry and drove literally from ocean to ocean. (We drove an extra two hours on the last day to make sure we put our feet in the Pacific, since Seattle’s not actually on the coast.) We stayed with friends, took a couple hundred pictures, and drank more varieties of beer than I had thought possible. We swam in lakes, rode horses, and played a green ukulele around a campfire. It may literally have been the time of my life. I planned a few science writing trips along the way — our visit to the historic Yerkes Observatory was featured on Wired last month, and there are more to come. 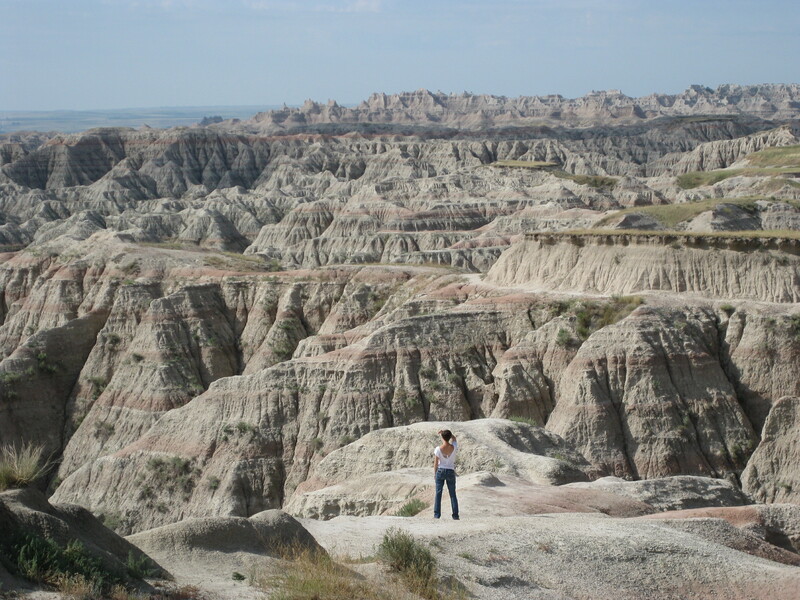 But one of my road buddies, Kristine Heiney (pictured above, in the Badlands of South Dakota), kept a much more powerful record: She wrote poems. And she’s getting some recognition for them. 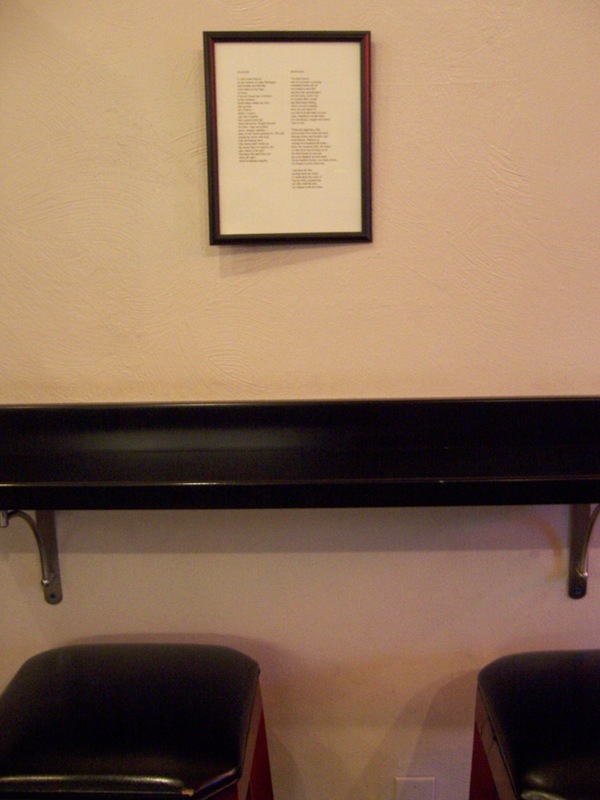 Thirteen of her poems (two from the road trip) will be hanging in Gimme! Coffee in Ithaca, New York for the entire month of November. If you’re anywhere near Ithaca, go check them out! They even have some science in them. In case you’re not going to be anywhere near Ithaca in November, Kristine said I could post the whole set of poems here. I can’t think of an introduction that would do them justice, so I’ll just let you go read them. They’re the best record I have of what those days felt like. Today is Ada Lovelace Day, a day for bloggers around the world to shine their bloggy spotlights on some tech-inclined women they admire. I chose three: Erika DeBenedictis, Katheryn Shi and Kate Rudolph. These women are award-winning physicists and mathematicians working to make space travel more efficient, predict the existence of new chemical compounds and decrypt the geometry of supercooled water. And none of them is older than 18. These badass ladies were finalists in the Intel Science Talent Search, one of the most presitgious high school science competitions around. The kids in this competition are seriously impressive. 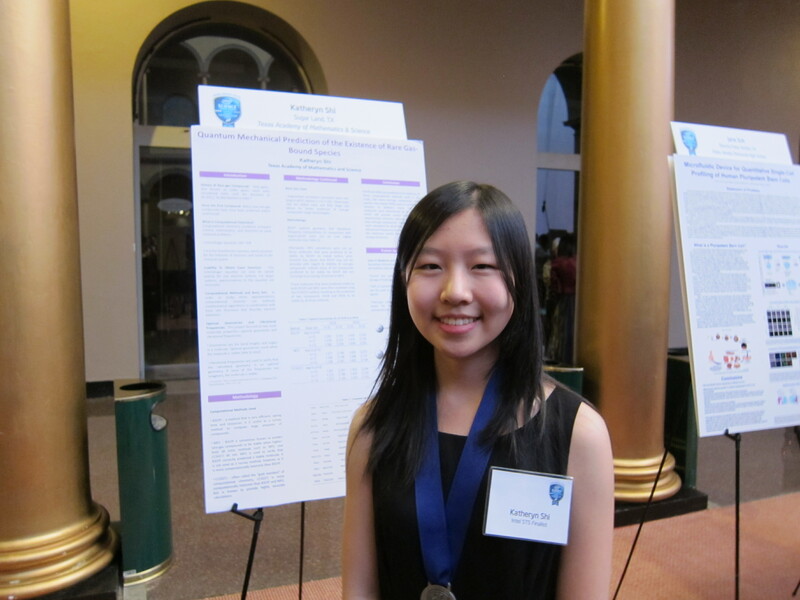 Not only do they spend their summers and weekends doing independent research on string theory and machine learning, but they all spent three hours at the National Academy of Science last Sunday explaining their projects to whoever wandered in (including, of course, the judges). They were orders of magnitude more poised and articulate than anyone I knew when I was 18. It’s pretty inspiring. Erika wrote navigation software that could help interplanetary spacecraft cut down their trips by a factor of 10. Imagine the gravity fields around planets as a topographical map, with hills where gravity pulls strongly toward either the planet or the sun and valleys where the planet’s gravity and the sun’s gravity nearly cancel each other out. Spacecraft can coast along gravitational lowlands–an “interplanetary superhighway“–with surprisingly little energy. But it’s not easy to find and stay on the roads, and current spaceships tend to head in the direction they’re aimed. I may be biased in favor of cool space travel ideas, but I’m not the only one who liked this one. Erika’s project won first prize. 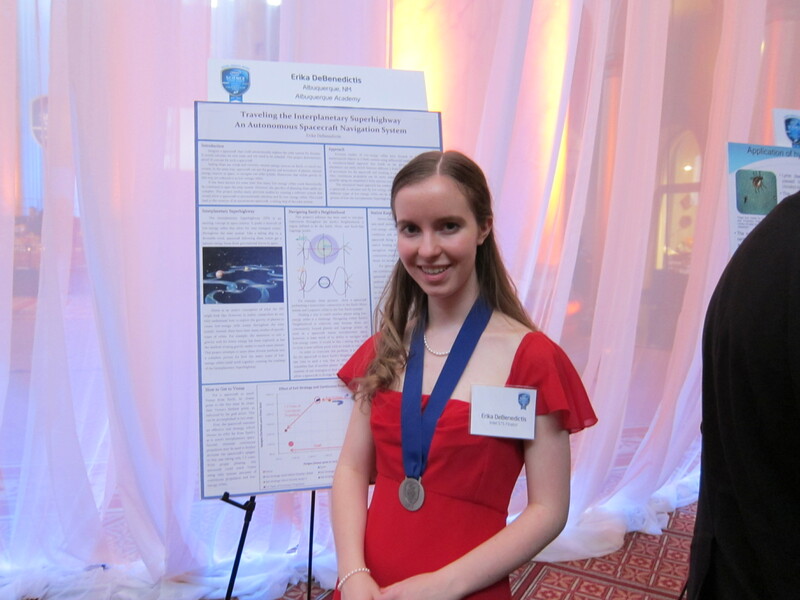 Katheryn used computational chemistry (mathematical algorthims that describe the insides of molecules, basically) to predict the existence of two new noble gas compounds, HArN and HKrN. Molecules like this are used in lasers for eye surgery, semiconductor manufacturing and tumor fighting, she said. The molecules are still hypothetical right now, but she hopes to work with synthetic chemists to bring them to life. 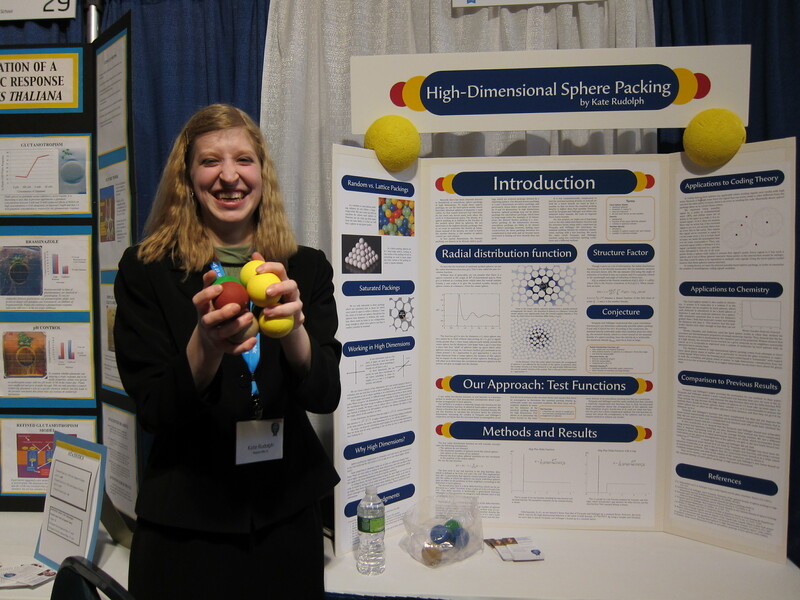 Katheryn was drawn to computational chemistry because it was so different from what she thought chemistry was supposed to be like. “I always thought of chemistry as blowing things up, mixing things together, but it’s not really the case,” she said. I thought that was interesting–the image of what science is and what scientists do, especially the images people have in high school, is often pretty far from reality. Some people get turned off when they learn the truth (weren’t you disappointed when you first realized chemists don’t always blow things up? I was), but Katheryn was turned on. It’s great that she came to it so early. Another awesome thing Katheryn learned early: She earned her second degree black belt in Tae Kwon Do when she was 12. She won my heart then and there, but her project was equally awesome. She studied the best way to make piles of spheres in many dimensions. In the three dimensions we’re used to, the best way to pack spheres is in a pyramid (you can test this yourself with a bunch of oranges). But packing theoretical hyperspheres in higher dimensions is different. The most efficient way to arrange the spheres in eight or 24 dimensions is a lattice, for instance, but in 10 dimensions, the best arrangement is random. These conclusions have real world applications in chemistry, where scientists try to cool liquid below its freezing point while keeping it liquid–that is, packing its atoms in the most efficient random organization possible. “You have to look at high dimensions, something that’s never going to happen in a real life state, to figure out what’s most efficient in chemistry,” Kate said. 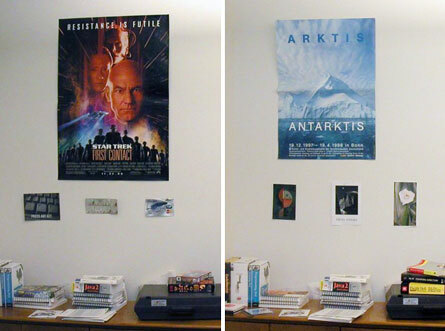 These were just the three projects I looked at most closely. Seventeen of the 40 finalists–and four of the top ten–were women. And having been so publicly recognized as one of the best high school researchers in the country (not one of the best female researchers, just the best, full stop), I bet no one will ever be able to make them feel like they’re not good enough. Go conquer the world, ladies. I am so looking forward to the rest of your careers. If hypothetically you knew a science writer who was going to interview the guy who discovered the first extrasolar planets, what would you want her to ask him? The story is for Wired’s “This Day in Tech History” section, for April 22, the day the paper in Science confirming the existence of three planets around pulsar PSR B1257+12 came out in 1994. So I can really ask him anything. What did you have for breakfast that day? What did your mom say when you told her? Those of you living in the Bay Area probably already know that on Thursday, April 9, vandals hacked up 10 fiberoptic cables and disabled landline, cell phone, and internet service in Santa Cruz and Santa Clara counties for nearly 24 hours. The vandals lifted 300-pound manhole covers and climbed down into underground vaults to get at the cables. They cut the cords in two different locations in about two hours. Clearly they thought about this a lot. There’s been a lot of discussion about whether the communication system is secure enough, how dependent we’ve all become on our cell phones (a few of my classmates went out for lunch after class, and we struggled mightily to figure out how we’d find each other downtown if we couldn’t call), and what’s going to happen to the culprits when they’re caught. Today’s fiber-optic cables are bundles of dozens of single hair-thin strands, each fiber made of highly purified glass – often pure silica – and coated in a cladding of impure glass that holds light beams inside. A single cable, about 4 inches thick, has the capability to hold dozens of fibers, which can carry pulses of light signals as far as 200 miles – either curving or in a straight line – at about two-thirds the speed of light. Inside each fiber, the light’s “message” is reflected again and again at an angle against the fiber’s wall as it travels along. That’s something I never really think about: our society runs on beams of light. Every time I check my email, call my mom, or buy groceries with my debit card, I’m sending a signal down a glowing cylinder that illuminates places no one ever sees. It’s nice to be reminded of the beauty in the mundane. Kepler, the Earth-like planet hunting observatory, is launching in about an hour! Watch events as they unfold on NASA TV. When Barack Obama took his presidential oath on January 20, a piece of the Mars rovers was there to commemorate it. Sort of. About a year ago, two scientists from NASA Ames and Carnegie Mellon decided to bring the Mars Rovers’ panoramic photo capabilities back to Earth. The resulting gadget, called a Gigapan, is a robotic camera tripod that pans and tilts to automatically take enormous photos. I wrote about it about a month ago (also on January 20, coincidentally) for my internship at SLAC Today and symmetry–the webmaster at the Exploratorium took some pictures of SLAC’s linear accelerator. They’re extraordinary. You can click on any point in the image and zoom in almost indefinitely without losing resolution. It’s so poetically satisfying. The Mars rovers (now in year five of their 90-day mission) are a perfect symbol of tenacity, resourcefulness, and progress that actually works. Let’s hope Obama can do the same.